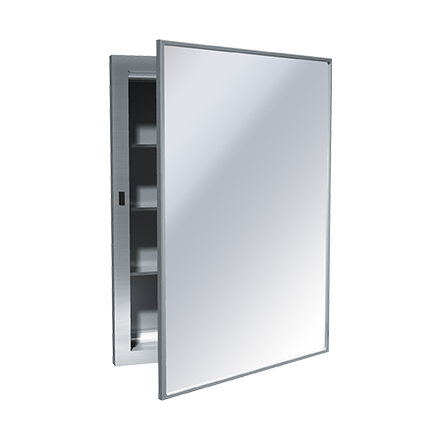 Swing door mirror frame is type 304 stainless steel with satin finish. Mirror is 1/4″ (6 mm), guaranteed for 15 years against silver spoilage. Door has full length piano hinge and magnetic catch. Three removable stainless steel shelves. User pulls door to access contents and manually pushes door shut. Adjust shelf spacing by removing shelves and reinserting in any of five (5) internally embossed tracks on each side of cabinet interior.